Saglek Air Station (1953-1993) - A remote Cold War Pinetree Line Radar Station first established in 1953 near Saglek Fjord in Labrador as Saglek Air Station. Initially manned by the USAF 924th AC&W Squadron and assigned an ID of N-29 that later became JSS ID LAB-2. Inactivated 30 Jun 1970, destroyed by fire in 1978, reconstructed as a Canadian North Warning System radar site CFS Saglek in 1988 and transitioned to unattended status in 1995. Saglek AS was constructed 1951-1953 as a Pinetree Line radar site and became operational in the fall of 1953 manned by the USAF 924th AC&W Squadron. This was one of the most remote radar sites with no supporting base or community close by. Fierce winter storms, sub-zero temperatures, and deep snowfalls made it difficult to keep equipment operational and posed a significant hazard to personnel. Support in the winter was by air and only during the summer season could supplies be brought in by ship. The squadron was tasked with maintaining the small airstrip so that supply aircraft could land. The tour length for military personnel was one year so there was a constant rotation of personnel with chronic shortages and a continuous training cycle. 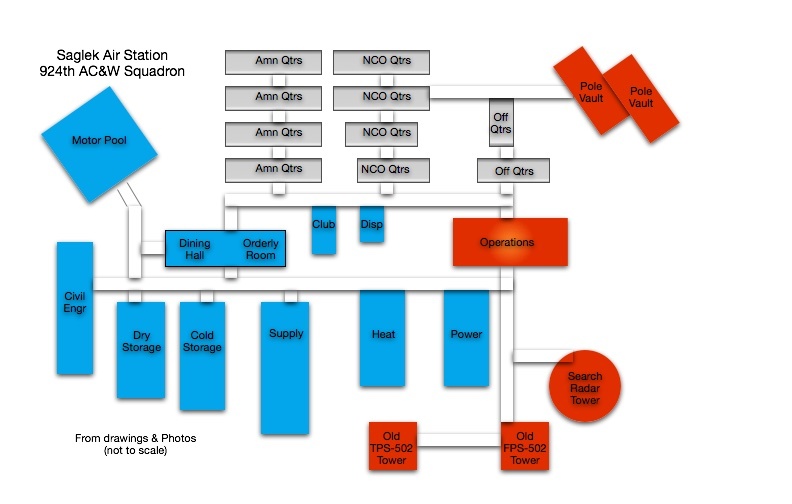 This station initially had both a Ground-Control Intercept (GCI) and early warning mission as well as operating an Air Defense Direction Center (ADDC). The early warning mission involved tracking and identifying all aircraft entering their airspace while the GCI mission involved guiding Air Force interceptors to any identified enemy aircraft. Controllers at the station vectored fighter aircraft at the correct course, and altitude speed to intercept enemy aircraft using voice commands via ground-to-air radio. Initial radar equipment included the FPS-3C primary search radar, a TPS-502 height-finder radar and an FPS-502 backup search radar. The primary search radar was later upgraded to an FPS-20A and then modified to an FPS-87A and finally modified to an FPS-93A. The TPS-502 height-finder radar and the backup FPS-502 search radar were removed about 1960. The site did not have a height-finder capability following the removal of the TPS-502 and the mission was reduced to that of a surveillance site. The major radar equipment listed on the 1961 Q2 historical report indicated that the TPS-502 and the FPS-502 radar sets had been removed leaving only the dual channel FPS-20A search radar, two UPX-6 IFF transmitters/receivers and eight PPI radar scopes. Source: Historical Record, 924th AC&W Squadron, Saglek, Labrador, 1 April 1961 to 30 June 1961. The radar equipment at Saglek Air Station was permanently shut down on 30 June 1970. The 924th Radar Squadron was deactivated on 31 Jul 1970 and the last personnel were scheduled to leave on 30 Sep 1970. The abandoned site was destroyed by fire in 1978. Reconstructed by the Canadian Government as a North Warning System radar site in 1988 and transitioned to unattended status on 22 September 1995. 13 Jun 1953 - Activated at Grenier Air Force Base, NH. 1 Apr 1957 - Reassigned to ADC and 4732nd Air Defense Group. 1 Apr 1960 - Transferred to Goose ADS. 31 Mar 1970 - Reassigned to 21st Air Division. 31 Jul 1970 - Inactivated. Saglek AS was constructed at the top of an 1800 foot cliff that descended down to Saglek Bay and the Atlantic Ocean on the northeast and sloped downward inland to sea level on the southwest. Most of the site was situated across the top of the cliff. The radar towers, operations building, orderly room, dining hall, supply, cold storage, dry storage, heat plant and power plant were located at the top, all connected by a central covered walkway system. Cascading down the hill from the upper connecting hallways were three sets of quarters, one for the officers, one for the NCOs and one for the airmen. Each set of quarters buildings were interconnected with covered walkways to allow personnel access to any part of the site without having to go outside during the winter months. Other facilities at the site included an airstrip and access to the water at the lower station. Up from the lower station were a BMEWS communications site and a TACAN Navaid. A road led up the hill to a motor pool building near the top of the hill. Just below the main site but connected to it was the "Pole Vault" troposcatter communications system. Operating as CFS Saglek with a North Warning System (NWS) ID of LAB-2. This is an unattended or minimally attended radar site with an FPS-117, 3D radar installed in 1991. Location: CFS Saglek, Newfoundland and Labrador, Canada. This page was last modified 21:24, 7 January 2019 by John Stanton. Based on work by Bill Thayer.